Every day, thousands of people climb on their bicycles and take to the streets in the Pittsburgh area. Not only is bicycling a fun activity, but it is also great for the environment, your health, and your pocketbook. However, bicycling does have a downside, as the risk of being involved in a bicycle accident is high. According to the National Highway Traffic Safety Administration (NHTSA), in 2012, 726 bicyclists died in accidents, while another estimated 49,000 suffered injuries. The number of bicycle accident fatalities rose 6 percent from 2011 to 2012. Bicyclists have the same rights to use the roads as drivers of motor vehicles. Bicycles do not have to remain close to the curb, but can instead take up as much space in a lane as they need to feel safe. However, many drivers fail to notice bicyclists or may become frustrated with the relatively slow speed of bicycles. This can result in unsafe passing behaviors and dangerous car accidents. Road hazards, such as potholes or cracks in the pavement that can catch a bicycle wheel and send a rider flying. All of the above involve a negligent party who should be held responsible for any injuries caused in an accident that results from their negligence. These are only a few examples of possible injuries, and many bicyclists suffer multiple injuries in a single accident. Such injuries can result in costly medical bills, time off of work, and can even leave victims with permanent disabilities such as paralysis or brain damage. Some bicycle accident victims are never able to work or live independently again. Bicycle accident victims can recover for their injuries and losses by filing a personal injury claim against the negligent party. Bicyclists involved in accidents often suffer life-changing injuries. If another person was responsible for your bicycle accident, you deserve proper compensation for all of your injuries. 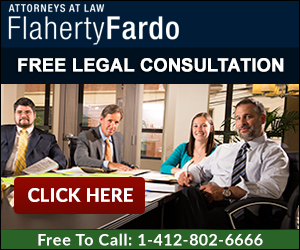 The experienced personal injury attorneys at the office of Flaherty Fardo are committed to helping victims of bicycle accidents receive the settlements or awards they deserve. We offer free consultations, so please do not hesitate to contact our office for help at (412) 802-6666 today.